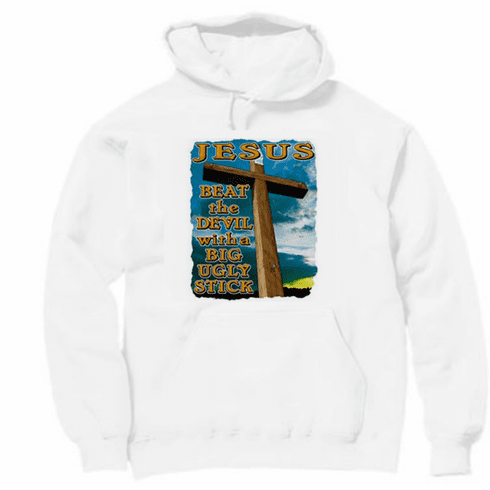 Christian pullover hooded hoodie sweatshirt Jesus beat the devil with a big ugly stick. Home/Our HoneVille.com Store/Christian Designs /Christian Designs page 2 /Christian Designs Page 3 /Christian shirt: Jesus beat the devil with a big ugly stick. /Christian pullover hooded hoodie sweatshirt Jesus beat the devil with a big ugly stick. Home/Our HoneVille.com Store/Christian Designs /Christian Designs page 4 /Christian Designs page 2 /Christian Designs Page 3 /Christian shirt: Jesus beat the devil with a big ugly stick. /Christian pullover hooded hoodie sweatshirt Jesus beat the devil with a big ugly stick. Home/Our HoneVille.com Store/Christian Designs /Christian Designs Page 3 /Christian shirt: Jesus beat the devil with a big ugly stick. /Christian pullover hooded hoodie sweatshirt Jesus beat the devil with a big ugly stick.